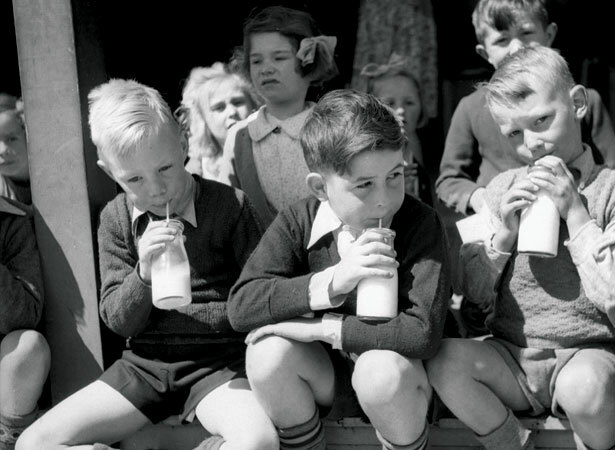 New Zealand schoolchildren received free milk between 1937 and 1967. The first Labour government introduced the scheme – a world first – to improve the health of young New Zealanders (and make use of surplus milk). Each day, milk monitors supplied a half-pint (284 ml) of milk to each pupil. By 1940 the milk was available to over 80 per cent of schoolchildren. For a few years during the Second World War, pupils also received an apple a day. The scheme lasted until 1967, when the government dropped it because of the cost – and because some were starting to question the health benefits of milk. In the 30 years of the scheme’s existence, thousands of kids gulped down their daily ration of milk. In the 1950s school milk bottles had cardboard tops with a small hole for the straw. Not everyone enjoyed it. In the days before schools had fridges and chillers, warm milk nauseated many. Dairy giant Fonterra revived the scheme in 2013, supplying free long-life milk to primary schools throughout New Zealand following a successful pilot project in Northland. We have 17 biographies, 8 articles, related to End of free school milk.